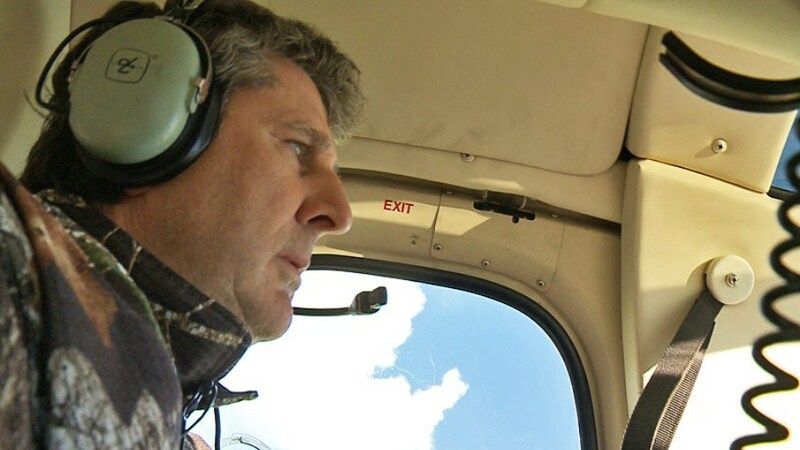 (Jan. 9, 2014) - Washington State football coach and celebrated outdoorsman Mike Leach's off-season trip to New Zealand in pursuit of Tahr will air on Gridiron Outdoors with Mike Pawlawski this weekend on the Outdoor Channel, once Friday and twice Saturday. This classic spot-and-stalk adventure on New Zealand's South Island can be seen Friday at 7:30 p.m. Pacific, and Saturday at both 4:30 a.m. Pacific and 5 p.m. Pacific. While Pawlawski, a former Cal quarterback and professional outdoorsman, is on the North Island pursuing Ram and Fallow Deer, Leach, who has already bagged a red stag, and local outfitter Shane Quinn go airborne to find the vaunted and mystical Tahr. And it's game-on, leading to an epic chase of an animal that Leach compares to "a scatback that can go in any direction at any time and do it very athletically, and a strong safety because it looks like it wouldn't mind hitting you head-on." It's an episode that has a little bit of everything - including breathtaking scenics, unique species and lots of sweaty palms - as Leach and Pawlawski cap a memorable week in the Southern Hemisphere. Catch it on the Outdoor Channel this weekend.